Shim Moore is now a solo artist. Simply known as SHIM, he’s done all the heavy lifting himself to re-ignite his music career with a bold new video and rocking new album (see the video for the new single ‘Crucified’ below). 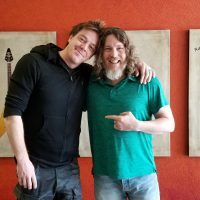 Jave Patterson took some time to talk with Shim about his leaving the Sick Puppies, the new album and more- like a song he dedicates to The Biggest Little City In The World, at the end of the video. LOOK MA, WE’RE ON FACEBOOK!